The Malay civet's tail is black above and ringed on the lower side. Their upperparts are greyish with numerous black spots and about 15 black bands in the tail. 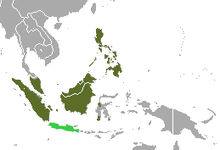 The historical range of the Malay civet includes Indonesia, Malaysia, Brunei, the Philippines and Singapore. In Malaysia, it occurs in Borneo, Banggi Island, Langkawi Island, Penang Island and in Peninsular Malaysia. It is also known from Sumatra. It was introduced to Sulawesi and the Maluku Islands. Museum records indicate that the Malay civet also occurred on the Indonesian islands of Java, Bawal and Telok Pai, and on the Philippine island Leyte. In 2012, an individual was photographed in Singapore. The Malay civet population in the Philippines may have originated in Borneo and colonized Palawan island naturally. It possibly later dispersed to the rest of Philippines through human introduction, because land connection between Philippines islands did not exist during last glacial period. The Malay civet inhabits a wide variety of habitats including forests, secondary habitats, cultivated land and the outskirts of villages. They range in elevations of up to 900 m (3,000 ft) on Gunung Madalan in Sabah and 1,100 m (3,600 ft) on Usun Apau and the Kelabit Upland in Sarawak. Malay civets are solitary, omnivorous, and primarily terrestrial. Malay civets are nocturnal. They feed on invertebrates and small vertebrates. Densities of Malay civets are higher in unlogged than in a logged forests. Fruit comprises a larger proportion of diet in unlogged forest compared to logged forest. With fruit contributing a larger percentage of the diet in unlogged forests, logging may lead to increased competition by other frugivores such as palm civets which may exploit fruit directly on trees unlike the mainly terrestrial Malay civet. Around the Malaysian Bera Lake Malay civets were found in logged forest. Arboreal, frugivorous civets are little affected by logging, whereas terrestrial, carnivorous or insectivorous species might be negatively impacted by logging. As a ground-living species it is exposed to snaring and other forms of ground-level trapping, and hunting with dogs. The limited survey in areas heavily used by people suggests it is rather well able to persist at general levels of threat. The species is occasionally hunted for food and treated as a pest as it raids poultry. In Borneo, the Malayan civet is negatively affected by the effects of timber harvesting. Viverra tangalunga is protected in Malaysia under the Wildlife Protection Act (WPA) of 1972. However, in many rural areas of Peninsular Malaysia civets are considered a pest because they prey on small livestock and raid fruit orchards. Section 55 of the WPA of 1972 allows farmers to shoot any wild animal that causes damage to their property, as long as reasonable efforts have been made to frighten the animal away. ^ a b c d e Duckworth, J.W. ; Mathai, J.; Wilting, A.; Holden, J.; Hearn, A. & Ross, J. (2016). "Viverra tangalunga". The IUCN Red List of Threatened Species. IUCN. 2016: e.T41708A45220284. doi:10.2305/IUCN.UK.2016-1.RLTS.T41708A45220284.en. Retrieved 30 October 2018. ^ Corbet, G., B. and J. E. Hill (1992). "Mammals of the Indomalayan region. A systematic review." Oxford University Press, Oxford. ^ Suyanto, A., Yoneda, M., Maryanto, I., Maharadatunkamsi Sugardjito J. (2002). Checklist of the Mammals of Indonesia: Scientific Names and Distribution Area Tables in Indonesia Including CITES, IUCN and Indonesian Categories for Conservation. LIPI-JICA-PHKA, Bogor, Indonesia. 63 pp. ^ Meiri, S. (2005). Small carnivores on small islands: new data based on old skulls. Small Carnivore Conservation 33: 21–23. ^ Lim, N. T., and Ouyang, X. (2012). Occurrence of the Malay civet, Viverra Tangalunga (Mammalia: Carnivora: Viverridae) in Singapore. Nature in Singapore 5: 79–81. ^ Colon, C. P. (2002). Ranging behaviour and activity of the Malay civet (Viverra tangalunga) in a logged and an unlogged forest in Danum Valley, East Malaysia. Journal of Zoology (London) 257: 473–485. ^ Kanchanasakha, B., Simcharoen, S. and Tin Than, U. 1998. Carnivores of Mainland South-East Asia. Endangered Species Unit, WWF-Thailand Project Office, Thailand. ^ Colón, C. P. (1999). Ecology of the Malay Civet (Viverra tangalunga) in a logged and unlogged forest in Sabah, East Malaysia. PhD dissertation. Fordham University, New York, USA. ^ Syakirah, S., Zubaid, A., Prentice, C., Lopez, A., Azmin, M. R. and Mohd-Yusof, A. (2000). A small-mammal survey at Tasek Bera, Pahang, Malaysia's first Ramsar site. Malayan Nature Journal, 54: 31–41. ^ Azlan, J. M. (2003). The diversity and conservation of mustelids, viverrids, and herpestids in a disturbed forest in Peninsular Malaysia. Small Carnivore Conservation 29 Archived 2015-01-29 at the Wayback Machine: 8–9. Wikimedia Commons has media related to Viverra tangalunga.